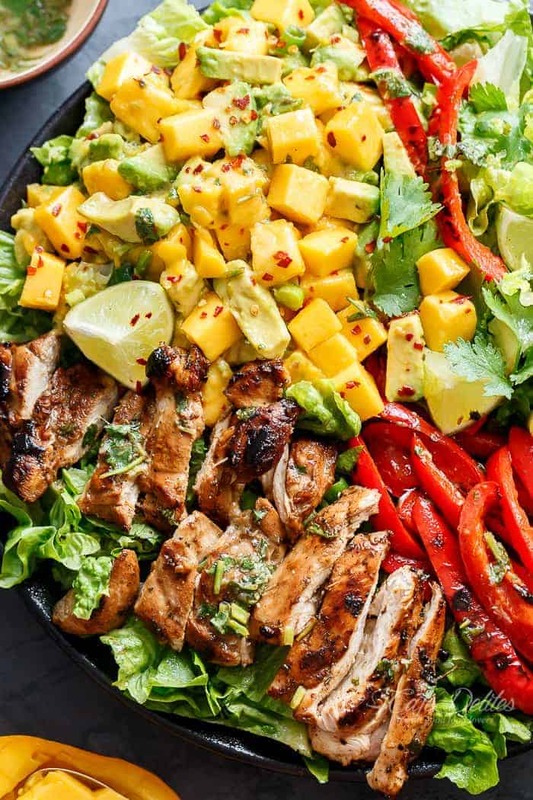 Cilantro Lime Chicken Salad With A Mango And Avocado Salsa! 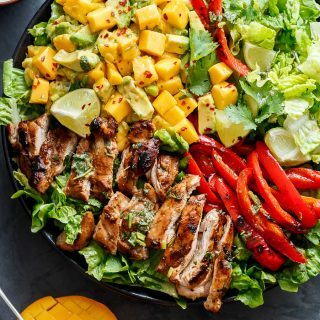 Holding onto Summer for a just a bit longer, this Cilantro Lime Chicken Salad has so much flavour in it with a creamy/sweet Mango Avocado Salsa for an extra Summer feel! With a marinade that doubles as a dressing, much like that Grilled Chilli Lime Chicken Fajita Salad, this salad is, dare I say, even better! Char-grilled red pepper (capsicum) slices, crispy romaine lettuce, and the tangy, sweet marinade soaked into tender chicken thighs would complete this salad right there. But, what outshines in this salad is the mango salsa. I was extremely hesitant to put mango in this salad, but, I could almost taste the pairing of creamy avocado with the juicy, sweetness of mango, and knew somehow that these would go together. And they did! Including the mango made this thing extremely addicting. We could NOT stop eating it. While creating this salad, my husband was watching me from the comfort of his safety zone, shaking his head while watching me throw ingredients around like no ones business, stopping to taste test every 5 seconds, adjusting ingredients and flavours as I went along, dancing to Beyonce in my kitchen. He eye-balled everything that was happening, looking at me like I was some crazed lunatic taking over his kitchen. Mango and Avocado? Together? With Chicken? You sure? Yes Paul. Calm down. Just watch. 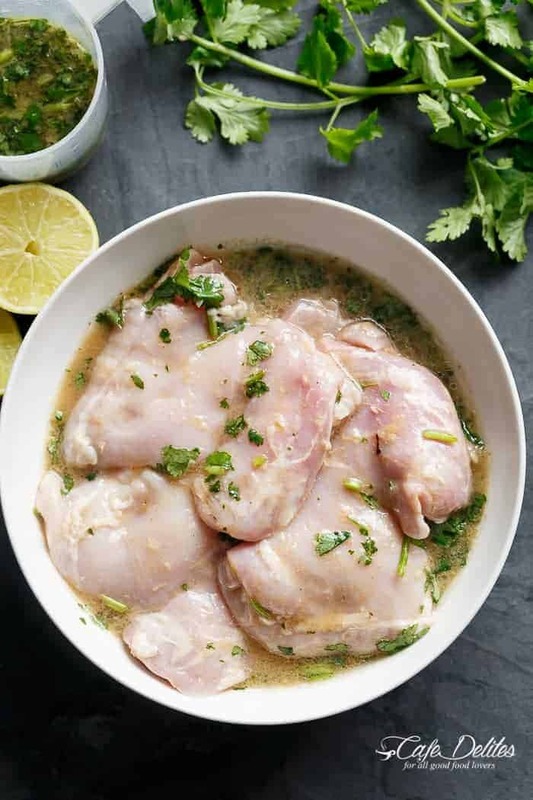 First, make up the marinade/dressing | Pour one third out into a shallow dish | Marinade the chicken thighs in that sweet, tangy, cilantro marinade | Reserve the untouched marinade to use as a dressing later. Simple? Next, pan fry or grill your chicken until cooked through. The honey and brown sugar in the marinade will char these slightly. Yuuuhm, right? Pan fry or grill you peppers. And prepare the best salsa you’ve ever tried in your life with a couple tablespoons of the reserved dressing. I know, I know. We ALL say that ours is the BEST. Let me just add ⇒ good luck not eating it all before it hits the salad. Arrange your salad and prepare for a mind-blown experience. And don’t say I didn’t warn you! 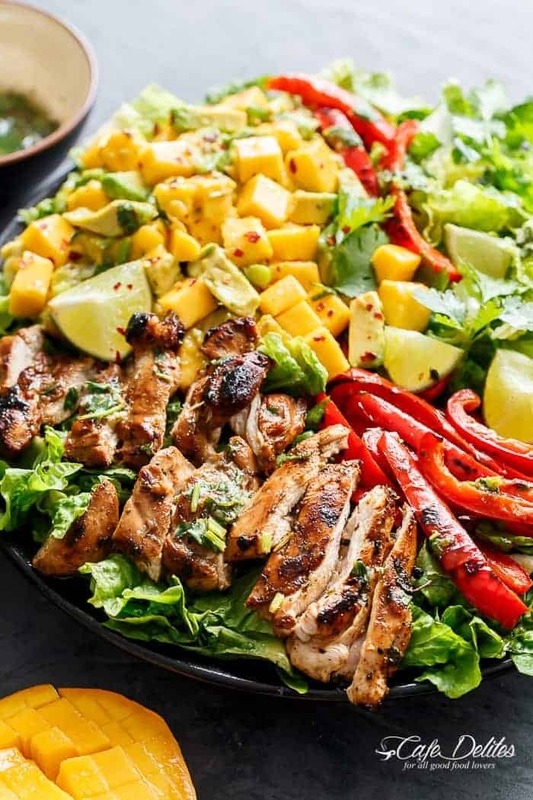 Grilled Cilantro Lime Chicken Salad With A Mango Salsa and a dressing that doubles as a marinade! Easy to make and BIG on flavours! Whisk marinade ingredients together to combine. Pour a third of the marinade into a shallow dish to marinade the chicken fillets for at least 15 minutes (ideally one to two hours if you have the time). Refrigerate the reserved untouched marinade to use as a dressing. 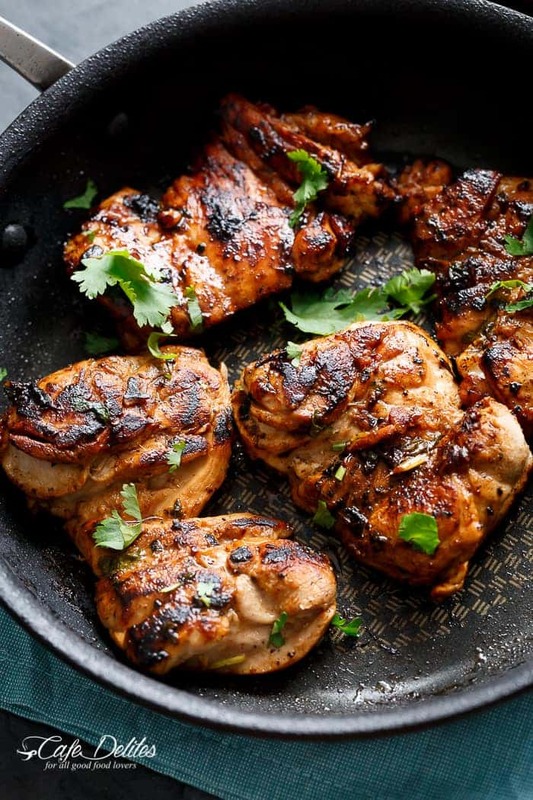 Heat about one teaspoon of oil in a grill pan or skillet over medium-high heat and grill chicken fillets on each side until golden, crispy and cooked through. (Grill in batches of two to prevent excess water being released.) Once chicken is cooked, set aside and allow to rest. 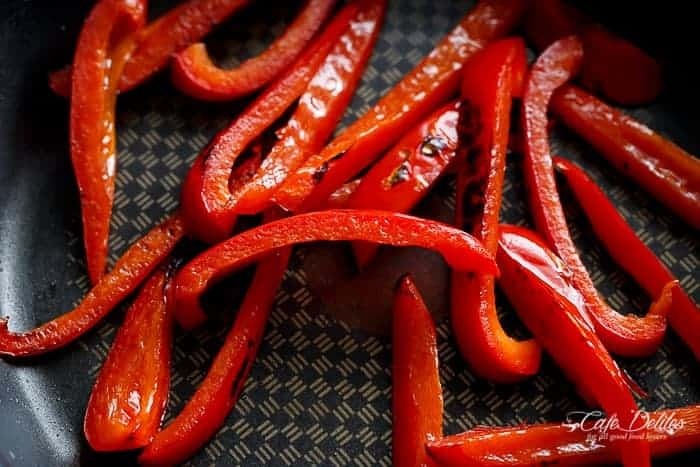 Wipe pan over with paper towel; drizzle with another teaspoon of oil and grill or fry peppers and until cooked to your liking. 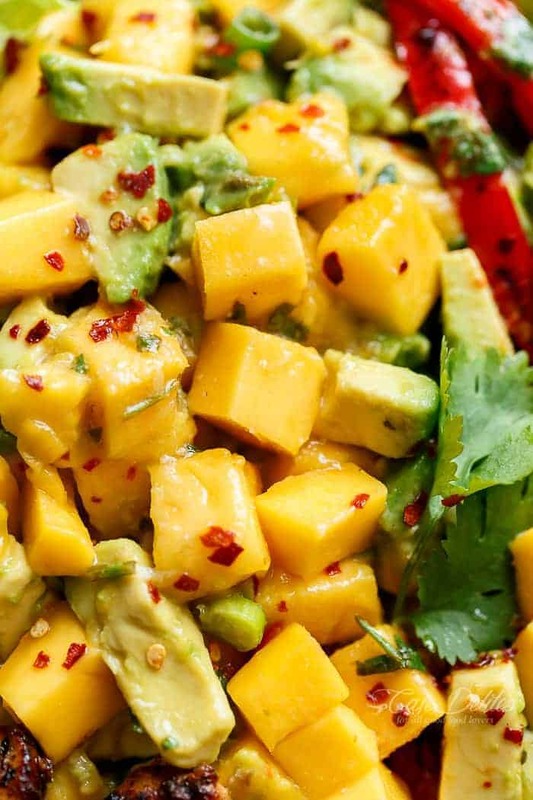 While peppers are cooking, prepare the mango salsa. Combine the mango, avocado and green onion in a bowl. Add in two tablespoons of the reserved dressing to the salsa. Set aside. Slice chicken into strips and prepare salad with leaves, sliced peppers and mango salsa. Top with the chicken strips. Drizzle with remaining dressing and serve with (optional) extra coriander leaves and red chill flakes. This is quite possibly the best salad I have ever had in my entire life. I heard droans when I said we were having salad, but every last bite was gobbled up! It’s now a regular in my home. Thanks for the amazing recipe! Would it be okay to let the chicken marinade overnight? Oh yes!! That is even better! It will add to the flavor! Enjoy! Yum! I’m not a huge fan of mango. My husband likes it, so I gave this a try. We both enjoyed this. It’s a great combination of flavor. This recipe is excellent and easy to make! This, recipe ended up looking exactly like the picture, and it tasted amazing! I made it for a family dinner and by the time the dish was passed to me, there was nothing left, except the lettuce! A must-try! This is my new favorite salad. The only thing I changed was to add some crispy tortilla strips for extra crunch. totally awesome and really filling. I didnt have red bellpeppers but will definitely make it again with them. do you have any special fish recipes? i cat wait to.try out more of your tasty recipes. First time ever commenting on a recipe- but this is the BEST salad I have ever ate. I almost couldn’t believe I made it! 😉 Thanks for the recipe!!!! This is a fantastic recipe! Probably the best salad I’ve ever tasted! ? I never normally leave comments on recipes, but this one was too good to not! 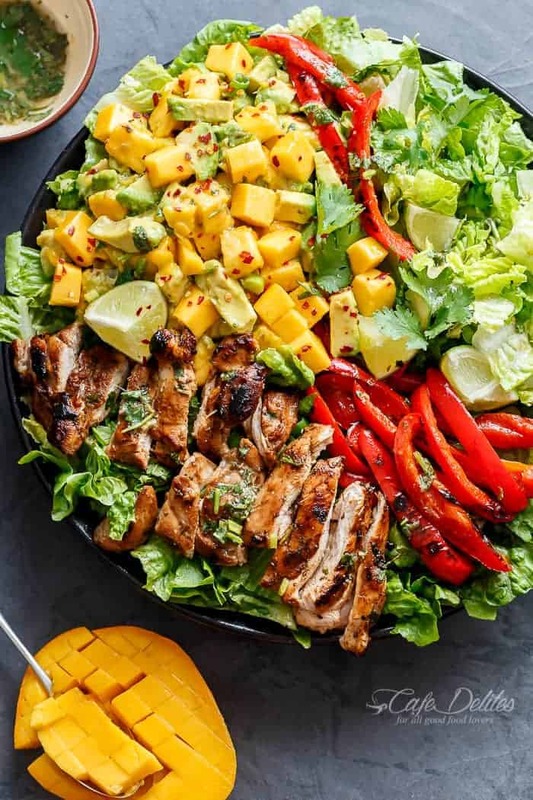 Everyone needs to know how delightful this salad is, especially the mango avocado salsa and it all looks so beautiful when plated. Made it for the first time a few weeks ago and will be making it again tonight. Thanks, Karina! This salad is AMAZING! I’ve made this one and the chicken caesar salad at least three times already. Tonight I am trying the honey mustard chicken and bacon salad. Thanks again for sharing. Mary scallions are shallots in Australia! Fantastic. Such bright flavors. I am a total foodie and always looking for new ways to appease everyone, ages 3-41 . This did the trick. I did add some onion when I grilled the peppers and I served it with a fruit salad as dessert. I feel satisfied but not stuffed. Thank you! You’re so welcome Michelle! I’m so happy to hear you liked it! Thanks so much for coming back to leave your feedback! This looks absolutely delicious and would love to make it for company this Friday. Could you tell me how much I need to add to the ingredients to satisfy 8 hungry people? ? I made this wonderful salad for dinner post-workout. It was so flavorful, and refreshing. I loved the aroma and how colorful everything was. The grilled pepper adds such a hearty kick, and the cumin in the marinade is reminiscent of chimichurri sauce. It was very filling, too. I would totally make this again. I would suggest crunchy tortilla strips as a garnish, but not necessary. Overall this was slammin. I am planning to make some more of these salads in your article. How fun! Absolutely delicious….couldn’t stop eating it. I charred the peppers on the barbie as the chicken was cooking and it added such nice flavour. I’ll be making this as my company lunch dish. Oh Yum! Thank you for coming back to let me know! I hope they all approve! Love this little bowl of sunshine! The fresh mango and charred chicken and peppers are a perfect contrast in flavor and are so colorful. Pretty and perfect for a lighter lunch! I made this tonight. Absolutely loved it. Thanks for a great recipe. Wow! That would excite anyone sitting down to dinner. I love it! Will definitely be making this. Thanks!